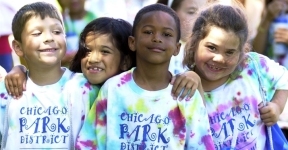 Thousands of spaces are still available for the Chicago Park District’s day camp program, which begins Tuesday, July 5. Standard day camps run six weeks, from July 5 – August 12, typically from 9 a.m. – 3 p.m. or 10 a.m. – 4 p.m., Monday through Friday. Many parks offer early morning and late-day sessions as well. Fees vary depending on location, offerings and hours. No child will be turned away for inability to pay. As part of the summer camp curriculum, campers will embark on an enriching journey through Chicago’s 77 neighborhoods. The camp theme, Explore the Spirit of Chicago – My Neighborhood, Our City, will offer new and unique ways for campers to enjoy their summer experience at their local parks, and explore our city through a series of exciting indoor and outdoor activities. La Villita, Sherman, Gage, Washtenaw, Franklin, Murray, Cornell Square, Lowe, Moran and Hermitage parks are a few of the locations that still have availability. For more information, contact your local park, visit www.chicagoparkdistrict.com or call 312-742-PLAY.